Added on October 21, 2013 by Lisa Homa. 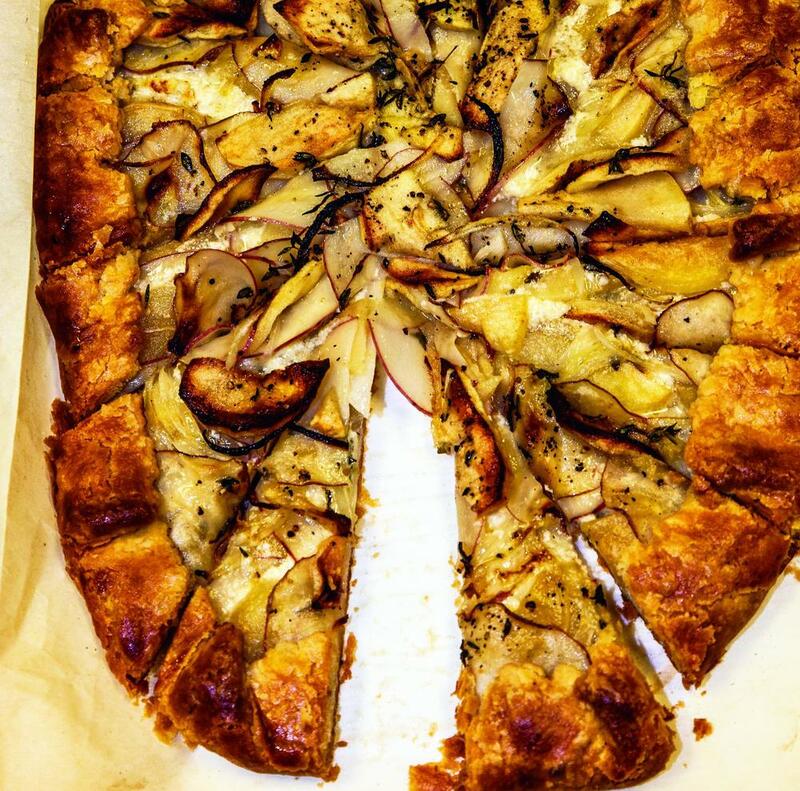 Last week the New York Women’s Culinary Alliance held its annual fall potluck. When I mention this event to friends it always elicits a variation on the same response: “Wow! I’d love to be invited to that. The food must be awesome!”. It is. This is the ultimate potluck, whose contributors are all highly-experienced culinary professionals – in this case solely women – vying for their dish to be named “Tastiest” or, at the very least, creating something you wouldn’t mind attaching your name to in this room full of demanding female foodies. Each year’s potluck has a theme. This year’s was simply (and appropriately for fall) “local”. The previous weekend I had loaded up with bags of just-picked apples from the orchard of our friends, the aptly-named Cooks of Obernburg, NY. And as always, I had plenty of potatoes and onions on hand. Being galette-crazy as I am, this was a no-brainer. Food & Wine had just featured one using a crème fraiche and pecorino base. I took that as my lead and made it my own. The key to a great galette is the combination of a flakey crust and an inspired filling, whether simple or complex. For this galette, I used potatoes sliced paper thin, apples sliced a bit thicker, and onion a width in between, because nobody wants to bite into raw potato or onion and I was aiming for cooked apples, not applesauce. I decided that thyme would be just the right herb for seasoning this beauty. Apparently my peers thought so, too, and voted mine this potluck's Tastiest Dish. The recipe is below. Enjoy! 1. On a floured surface, roll out pastry into an oblong (approx. 11"x15"). This is a fairly delicate pastry; in order to move it onto a parchment lined sheet pan, roll pastry onto your rolling pin first and unroll it out onto your lined pan. 3. In a small bowl, combine creme fraiche and grated cheese. Spread onto pastry, leaving a 2" border all around. Cover pastry with plastic wrap and refrigerate until rest of filling is ready. 4. Using a mandoline or Benriner, slice potatoes close to paper thin. 5. Peel and core apples. Slice about 3/8" thick. Toss potatoes and apples in 1 tablespoon of the melted butter and cover. 6. Half the onion length-wise; slice thinly and toss with potato apple mix. 7. Take sheet pan with pastry from fridge and layer potato, apple and onion mix over the cheese portion of the pastry still leaving the 2" border. Quickly alternate potato and apple as you go, sprinkling the onions and adding thyme along the way. 8. Finish by brushing the potato/apple mix with remaining 1 tablespoon of butter; sprinkle with remaining thyme, salt and pepper. 9. Fold perimeter pastry over onto the galette, pleating as you go. The overlap onto the vegetable/fruit mix will be about 1-1/2" to 2" all around. 10. Brush the egg wash onto the pleated pastry border. 11. Bake the galette in the lower 1/3 of the oven for about 45 minutes or until the center is bubbling and pastry is golden brown. Allow to cool for 15 minutes before slicing. Best served warm or at room temperature. If cool, can easily be reheated in a 350-degree oven. Yield: Approx. 20 thin slices. My crust is classic pate brisee style. I recommend making the dough ahead, allowing glutens to relax. Add flour, salt and butter to bowl of food processor fit with blade attachment. Process until butter forms small peas. Add egg plus cold water to make a shy 1/3 cup. Pulse until dough starts to pull together (don't overwork). Turn out onto floured surface. Pull together; divide into two 5" discs. Wrap individually in plastic wrap. Refrigerate for up to five days. May freeze for up to one month. Defrost for use. Dough should be cool to touch for rolling, not room temperature. Makes 2 9" crusts for pie or galette. Added notes for flakier crust: I allow crust to relax in fridge after rolling out and before filling. Whether sitting in a pie plate or on a sheet pan, cover with plastic wrap and chill while prepping fruit or other filling. If crust is rolled out/ready when fruit is prepped, it will keep the fruit/sugar mix from sitting and weeping too much before baking.